The Centre for Computing History is all set to host Cambridge’s first VR E-Sports Event on Tuesday 29 November. Visitors on the evening will be able to experience the PlayStation Pro and PS VR. With RIGS: Mechanized Combat League, Sony and Guerrilla Cambridge have created a game that’s half team-sports and half first person shooter for this PlayStation VR debut. Sony’s obsession with brightly coloured futuristic visions has been evident since the original PlayStation launched with Wipeout. There are parallels between Wipeout and RIGS. Wipeout took advantage of the original PlayStation’s 3D and enhanced pixel-pushing power, while RIGS is a first-person shooter adapted to work in virtual reality. 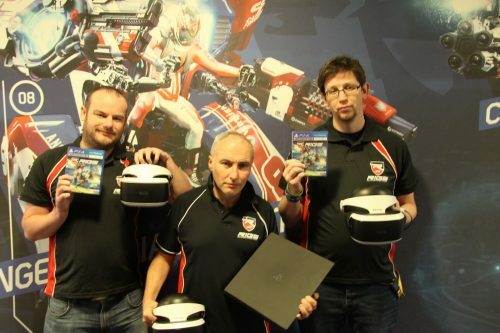 Centre Director, Jason Fitzpatrick said: “If you haven’t yet experienced the amazing PlayStation Virtual Reality headset this is your chance! For this special night, we’ll have eight PlayStation Pro game consoles out with six configured in a multiplayer RIGS Mechanized Combat League set-up. This presentation will be followed by an e-sports gaming event with six rounds of six players each with around 15 minutes of RIGS game play. Guerrilla staff will be commentating and game play will be projected on to the big screen. The winners of each round will enter the final with a chance to claim the title and win a signed copy of the game and T-Shirt. For those who don’t enjoy competitive gameplay there will be more PlayStation VR set-ups available to use. In addition, there will be other related machines from the museum’s collection including the Nintendo Virtual Boy. Please note that this event not suitable for children under the age of 12 due to the fact that the PSVR is not for use by children within this age range. Spaces for this event are limited, so booking is required.